A new tool that measures the overall accessibility of neighbourhoods has been piloted in Melbourne by a group named Visionary Design Development. A pilot project in Kensington Melbourne demonstrated the Universal Mobility Index (UMI) tool, the aim to assess the overall accessibility of a neighbourhood, identifying and prioritising barriers for removal. A focus group was conducted prior to the pilot. This forum revealed that people with disabilities encountered barriers to mobility frequently in their everyday lives. Secondly that current methods of detecting, reporting and treating barriers are haphazard, lacking any systemic, logical approach. There was no consensus on which parts of the built environment were likely to present the most barriers — Commercial, Public Buildings or Infrastructure. It was thought that Private Dwellings were likely to be more inaccessible than the other three categories. The UMI pilot area included the strip shopping area of Kensington and a surrounding area comprising commercial and public buildings, private dwellings and infrastructure such as footpaths, road crossings, street furniture, railway stations and bus stops and so forth. Groups of people with differing disabilities affecting their mobility in the built environment inspected a statistically significant random sample. They rated the selected elements on a scientific scale, providing date for analysis. 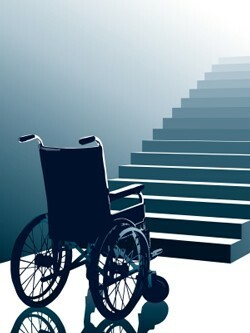 The different elements of the built environment were rated on a scale; the result confirmed claims by disabled persons’ organisations that urban environments discriminately constrain the mobility of those with mobility impairments, limiting educational, employment, recreational opportunities and causing social exclusion. decision making on how their local environment can be made more accessible. Adoption of the UMI by government, responsible authorities and disabled persons’ organisations can address the current fragmented and exclusionary nature of access considerations across the built environment. A second part of the UMI, the Policy Environment Component used a questionnaire to assess the human rights agreements and disability discrimination act operating in the country of the pilot area. Additionally if/how people with disabilities have a voice in policy formulation affecting the accessibility of the built environment via a disability advisory committee. All the above and more was combined in a final report to produce the UMI. Mary Ann Jackson from Visionary Design Development, an architect, planner and access consultant who authored the report, said: “The UMI is inclusive and participatory, placing people with disabilities at the centre of decision making on how their local environment can be made more accessible.